Aaron Hodgdon of Oxford smiles as the opening credits roll at Smitty's Cinema in Topsham on Sunday night while during the Game of Thrones public viewing party. It was the first episode of the popular HBO show's eighth and final season. TOPSHAM, Maine — Aaron Hodgdon of Oxford said he’s rooting for Jon Snow. “He’s always come back from adversity and he’s always remained true to his beliefs and his family,” he said, wearing a black “Game of Thrones” T-shirt outside Theater 5 at Smitty’s Cinemas in Topsham, where nearly every seat was filled for the premier episode of the HBO show’s eighth and final season. Jasmine Smith of Brunswick, wearing a green-and-white House Stark dress, said she hopes Daenerys Targaryen reigns supreme. “She’s shown in previous cities she can be a just and fair ruler,” she said. 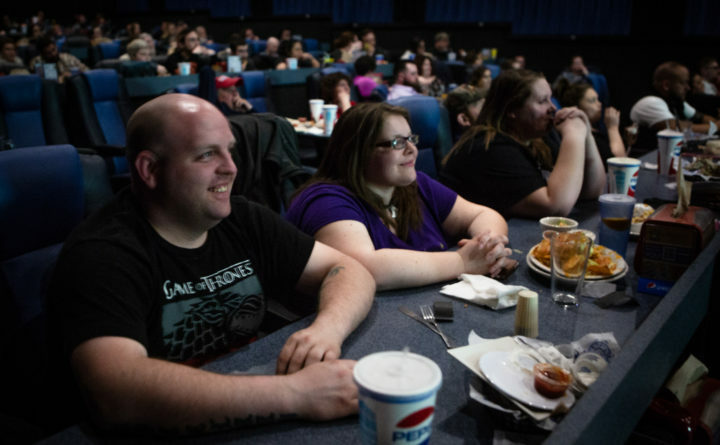 Smitty’s, which has four locations in southern Maine and has shown the weekly episodes of “Game of Thrones” on the big screens going back to Season 7, was forced to open a second theater in Topsham to accommodate the crowds turning out for highly anticipated new season. 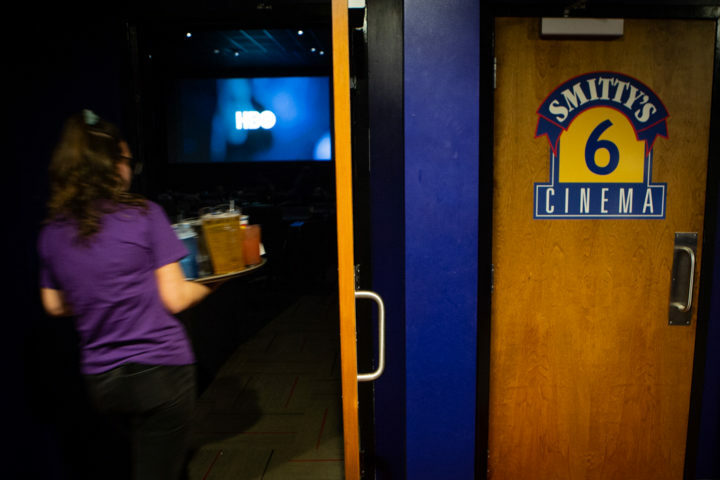 A server delivers drinks to a packed theater at Smitty's Cinema in Topsham on Sunday night for the Game of Thrones public viewing party. It was the first episode of the popular HBO show's eighth and final season. Kyle Kenney, the front-of-house manager in Topsham, said a line began forming for the 9 p.m. episode at 6 p.m. and stretched out of the building. The multi-screen cinema, which offers full meal and beverage service for movie-goers, whipped up a “Game of Thrones” menu — things like Cersei’s Sinner Sundae and Melisandre’s Mozz mozzarella sticks. Fans were also treated to prize giveaways from sponsors Shipyard Brewing Co. and Ice Pik vodka — T-shirts, pint glasses and Portland Sea Dogs baseball tickets. It’s been 20 months since Season 7 ended and while viewership numbers for the Season 8 opener won’t be in until later Monday, the previous season’s premiere attracted more than 10 million viewers. 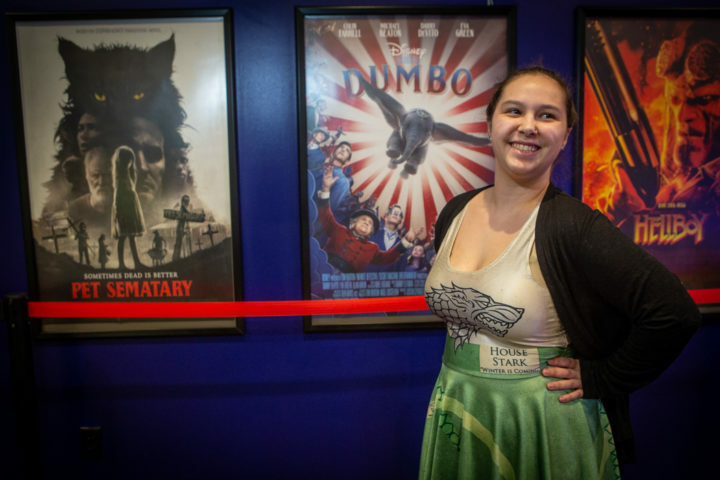 Jasmine Smith of Brunswick sports a House Stark dress at Smitty's Cinema in Topsham on Sunday night while attending the Game of Thrones public viewing party. It was the first episode of the popular HBO show's eighth and final season. The wildly popular television drama is known for plot twists and the gruesome deaths of significant characters, but there were no big gasp or cheer moments for the Topsham audience in Sunday night’s premiere. Hodgdon and Smith may yet both get their way, as Snow and Targaryen began the episode riding side-by-side into Winterfell leading a massive army in preparation for what’s expected to be a huge upcoming battle against an invading horde of undead soldiers. Their allegiance — and burgeoning romance — could get complicated, given the news Snow received about his true lineage. But for now, they seem to be holding it together. Hodgdon made his prediction for how this will all play out. “I don’t think [Jon Snow] is going to be the sole survivor or sole victor, but I think he’ll share the victory,” he said.